As we approach the start of raspberry bloom it is worthwhile to review the fungicides available for cane and fruit rot management in commercial raspberry production. I have listed these fungicides below, grouping them by their mode of action (eg. protectants, translaminar, systemic, etc) and have noted their chemical family, resistance development risk, application rate, diseases they are labeled to control, application timing, and cost. 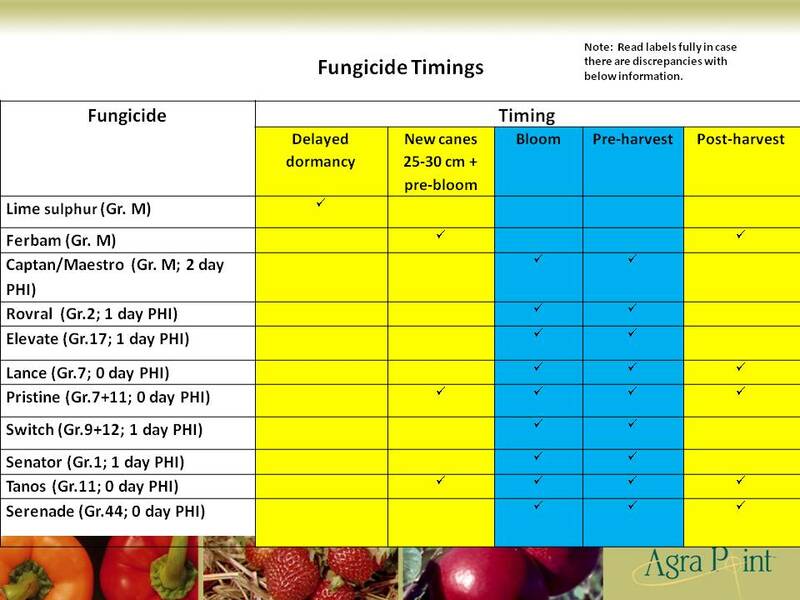 To simplify this further I have prepared a table at the end of the list which summarizes the fungicides and the timings for their use. The yellow columns represent the timings when a registered fungicide is applied for cane disease control. 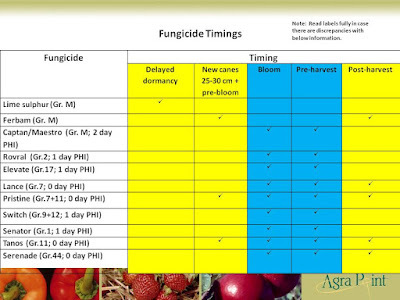 The blue columns apply to the timings when the registered fungicides are applied primarily for fruit rot management. A checked box indicates that a given fungicide is registered for the indicated timing. As indicated in the timing table, the best times to control fruit rot are during bloom and pre-harvest. We have always felt that if there has been good protection over this period fruit rot infections would be minimal; however, some growers have had problems with in-harvest fruit rot (particularly in wet years) and have asked if any of the fungicides could be legally applied through harvest. Examining the labels, I can see no reason why Lance or Serenade couldn’t be used in harvest - both have 0 day pre-harvest intervals (PHI’s) and there is nothing on their labels to suggest they can’t be used during harvest. Having said this, I don’t think in most years they would be necessary if a good bloom and pre-harvest protection program was employed. On a final note, many of the fungicides are a high risk of resistance development with consecutive applications so please rotate with other chemistries. Also, make sure you read the labels carefully as there may be warnings, cautions and possible discrepancies with the presented information. In the end, you are responsible for the pesticide applications made on your farm. • Apply when flower buds visible and repeat at 7-10 day intervals. Alternate with other fungicides. Maximum 8 applications per year. • Begin applications at 10% bloom and continue up to 1 day before harvest. Applications should be made at 7-10 day intervals or when conditions favour disease. Maximum 4 per year. Avoid more than 2 consecutive applications. • Make first application during early bloom, a second 7-10 days later, a third can be made if conditions favour disease. Avoid more than 2 consecutive applications of Switch or other Gr.9 or 12 fungicides. • Apply during bloom and repeat at 7-10 day intervals as necessary. Rotate with fungicides from different chemical groups. • Apply at first sign of disease and then at 7-10 day intervals.